Monti really is one of the most charming areas of the Eternal City. With its narrow and winding streets, buzzing social scene, ideal location near the Colosseum and the Fontana di Piazza della Madonna dei Monti, it is indeed a hit for dining too. You’ll find reasonable prices and a great variety of Italian and foreign cuisine (which is hard to find in Rome). 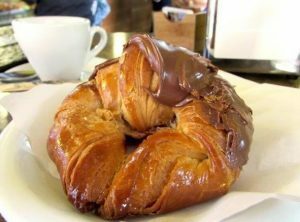 Whether you’re looking for a morning croissant or a hearty plate of pasta, one visit to Monti will have you hooked. Here’s a list of the best places to eat in Monti. La Licata certainly gives you the breakfast fix you need. You are greeted by dozens of pastries and cakes on display. Choose from juice drinks such as beetroot, fennel and orange, or their newest addition of grapefruit and ginger priced only at €5. La Licata also offers gluten-free, soya and vegan options, so it’s certainly superfood ahoy here! For those of you looking for a slower and heartier start to the day, La Licata has crafted an American and pancake breakfast as well as an omelette option too. Breakfast deals include €6 for an espresso, tea or cappuccino, an orange juice and a croissant for another type of sit-down breakfast. Although breakfast at La Licata is a must-have, they’re open for lunch and aperitif as well. Marolina is the ultimate place to get traditional Italian food with a twist. Don’t be alarmed by the plastic plates and cutlery, this is not fast food, it’s all about the that Marolina does so well. Some specialties include the best fish meatballs we have ever tasted and the most divine green pesto pasta dish. The ravioli is a favorite during the winter, boasting pumpkin, chestnut and meltedparmesan. Make sure to try the pecorino which is our preferred cheese! Well priced with the most expensive dish at €11, it is affordable, good-quality meals that puts Marolina at the top of the list. With traditional interior, a warm ambiance, and a different yet authentic Italian menu, La Taverna dei Fori Imperiali is the perfect spot for visiting with friends and family members. For starters you have the classics mixed with interesting food options like toasted bread with Tuscany style liver pâté, a melt in the mouh dish that is highly recommended. 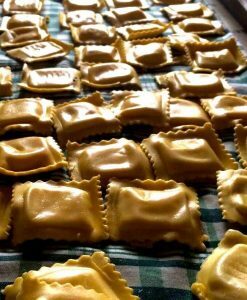 The traditional first course ‘pasta alla romana’ is priced at only €12 and can be paired with Roman tripe as a main dish for the same price. Don’t miss the artichokes either! The divine desserts, like the candy nougat ice cream, will keep you coming back for more. It’s one of those restaurants where you really feel like you’re in the roots of Italian culture and the centre of some foodie specialities. What good is a Roman meal without gelato after? This little hotspot is the go-to gelato stop in Monti. There are an array of flavours from traditional options (pistachio and cream) to more alternative flavours like prickly pear. 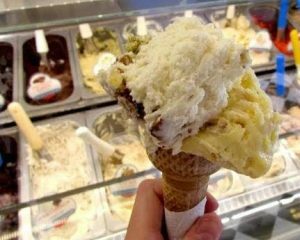 With your classic cone and cup options, you can gorge on your favourite gelato however you like at the cheap price of 3 flavors for €2.50. Gelateria dell’Angeletto is particularly popular in the summer due to its ideal location by the famous Fontana di Piazza della Madonna dei Monti and is crammed full of people getting their gelato fix. The highly praised reviews and range of dessert goodies such as crepes guarantee this little number a spot on our Top 5 list. Although it’s hard to find decent foreign food in the boot, The Guru is one of the limited godsends in Rome. With appetizing curries and that gorgeous naan and fluffy pilau rice that you so often crave – eat your heart out my friend. Our personal favourite is the chicken Tikka Massala, but we suggest the Palak paneer for a classic Indian cheese dish and the Vindaloo lamb for those who like it hot. There are vegetarian and fish tasting menus at €18 and €19 a head. Initially, the portions look small, but dig in and you’ll surely be stuffed by the end of the, unable to move in your happy food coma. Monti is one of those neighbourhoods where you truly feel like you’re in the heart of a striking and alluring area in Rome. It has incredible architecture to discover, the sweetest streets to explore and some of the best food in the capital. Trust us, you are in for something wonderful at this go-to place for any local or inquisitive expat. Trastevere is also another well-loved foodie part of Rome. With its warm charm and vibrant atmosphere, it is another one of the places that is top of the list for any tourist or local. 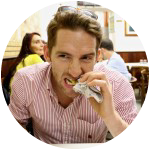 Try our Trastevere locals food tasting tour to really enjoy and take advantage of all of that foodie goodness. 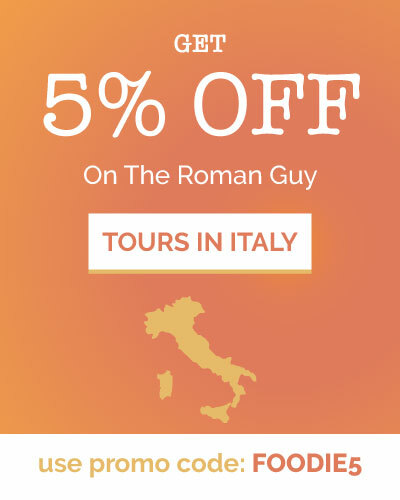 See The Roman Guy Tours in Italy for more details. Remember that if you’re in MONTI, you’re near the Colosseum! If you want a professional to show you around and behind the scenes, make sure you check out this VIP Colosseum Arena Floor Tour!